Little Common player-manager Russell Eldridge was keen to savour ‘a fantastic achievement’ after the football club completed a league and cup double. 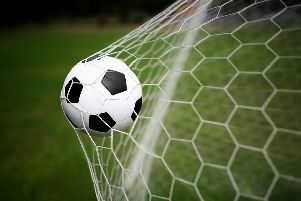 The Commoners added the Macron Store Southern Combination League Division One title to the Division One Challenge Cup after beating Billingshurst 8-0 in their final game of the season on Saturday. The 35-year-old dedicated the club’s success to his grandad Ken Cherry, who founded the club in 1966 and was still its chairman at the time of his passing in January 2016. “On a personal note I’m absolutely made up,” continued Eldridge. “I’m just obviously sad that grandad’s not here to see it because he would be in his absolute element. That’s why we’re here ultimately and today he would be celebrating as much as the boys are. Eldridge has played at a higher level for the majority of his career with clubs such as Hastings United, Horsham and Horsham YMCA, but says Common’s success this term has been his proudest moment. “This is the pinnacle of my football career,” he went on. “I’ve played at a higher level, but I haven’t had much success as such. Individually I’ve played in some good teams, but this is what it’s about. “This is where I wanted to come back to. I came back six or seven years ago, we obviously staved off relegation, finished in the top three numerous times, but ground grading has been our problem. “We finished second last year and it would’ve been easy to sit back and feel sorry for ourselves (at being denied promotion for ground grading reasons), but we didn’t and we kicked on again this season. Common will line up in the Premier Division next season for the first time in their history, and can look forward to meetings with clubs such as Eastbourne Town and landlords Eastbourne United AFC. “We want to enjoy our success, have a little bit of a rest and come back fighting,” Eldridge added. “It’s a challenge because we’ve got players in the group who haven’t played at that level. It’s a challenge to us individually and collectively to come again.